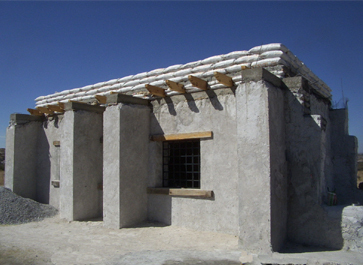 We were asked to oversee and train a crew to build an Earthbag house in Mexico. 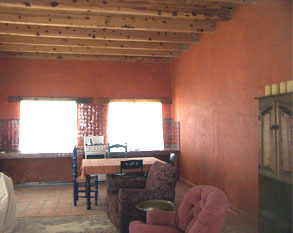 The style is based upon the traditional southwestern adobe design. 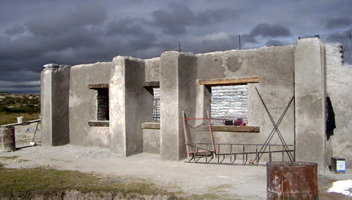 Beginning of the foundation and layout. 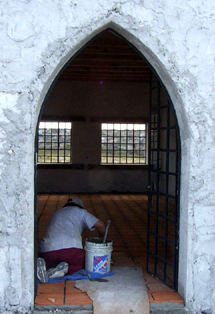 Inside view of the interior buttresses and doorway. 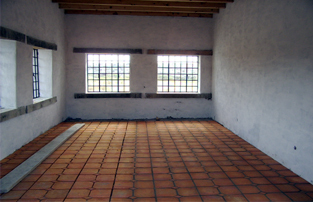 Laying the flooring of the large kitchen/diningroom. The finished house with first coat of lime wash.
Sept. 16, 2010: I am passing this info on to anyone I think might have a network of people who would be interested in a house in the country for a ridiculous price. Basically, I want to get out of the hassle of owning property and the house has been vandalized since my house sitters left in April. 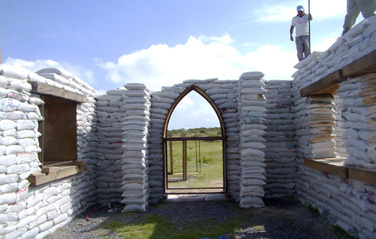 It is still fine structurally but needs about 3-5 thousand dollars to put it right. I would sell it for $40,000 or less and I have about $80,000 in it. There is a hectare of land ( 2.5 acres). 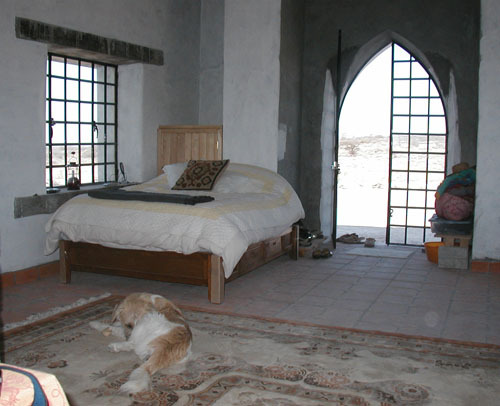 It is in the country about 15 minutes from San Miguel de Allende in a beautiful, private setting with mountains all around and good soil for growing near the house. 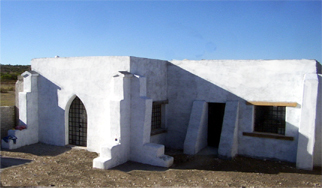 It needs a well or water collection system which would be easy given the big, flat roof. It is off the grid but electrical poles are not so far away and there is lots of sun for solar. 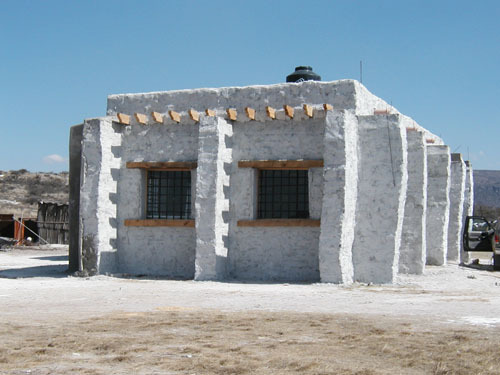 The house needs to be occupied or it needs a watchman which in Mexico is not expensive. When I had a regular watchman, nothing major was ever stolen but it is the way that when houses are empty things get stolen without the normal procedure of having a watchman checking in. 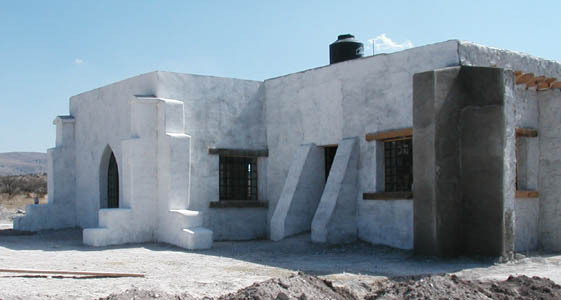 The house is earth bag construction covered with a solid cement adobe mix. There is a large walled garden with some nice plantings.The walls are about a meter thick so it is always cool or warm enough depending on the season. It is a great opportunity to buy something near a fabulous international town but in a lovely, country setting.